In Part II of the text (Chapters 3–8), Jones walks students through a uniquely accessible introduction to modern growth theory. In Chapters 5 and 8, he combines the Solow Model with complete, accessible coverage of the Romer Model (the foundation of modern growth theory) to provide a more accurate explanation of how growth really works. Innovative coverage of the short run aids the transition to the modern IS-MP model from the traditional IS-LM model. A new primer in Chapter 12 shows students how the IS-MP model compares with the IS-LM approach they may have encountered in their Principles course. This comparison builds understanding and gives context for applying the IS-MP model in the chapter. 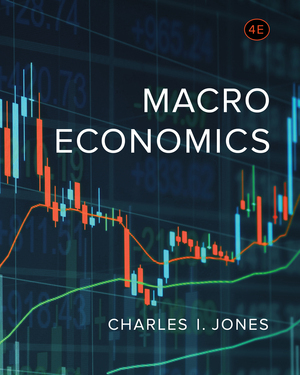 To truly analyze macroeconomy, students must analyze current data and real-world situations, then apply their knowledge using models and equations. 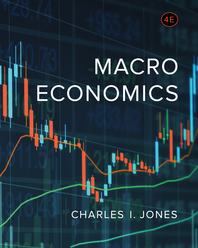 Macroeconomics provides the necessary tools ,including new sections on the aftermath of the great recession, over 90 charts and tables that have been meticulously created with new data, a primer on using the Federal Reserve's FRED database, and more. Every chapter includes two complete Worked Exercises that walk students step-by-step through a problem involving an important chapter concept.